These are truly great times for Pakistani cinema! I was so proud that this weekend three Pakistani films were released in Calgary (Canada): Parwaaz Hai Junoon, Load Wedding and Jawani Phir Nahi Ani 2. I had to pick one for this weekend and here is a Parwaaz Hai Junoon review! I did not want my husband to completely loose his cool if I decided to watch all three (and yes, I did feel like doing that)! While load wedding is based on a social issue and JPNA2 is pure entertainment, I picked Parwaaz Hai Junoon due to its patriotic appeal. The movie is made beautifully and they have definitely picked an extremely good-looking cast! Parwaaz Hai Junoon is a tribute to the men and women of Pakistan Air Force (PAF). My father-in-law is a retired PAF officer and the movie truly captures the essence of PAF. The movie shows us past and present in parallel. The story-telling is crisp and fast moving. The visual effects are great and the songs are pleasant. Many girls from my generation dreamed of joining the air force. 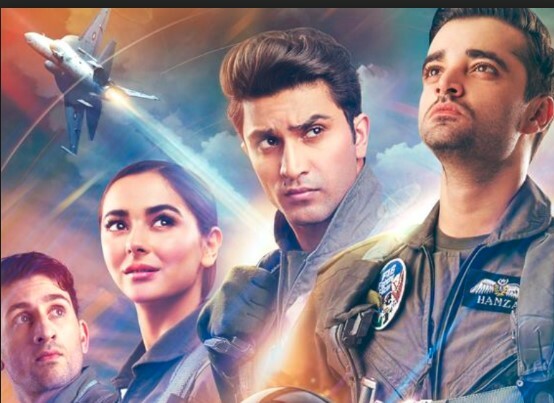 It was a delight to see Hania Aamir in a lead role go through her training with determination and dignity and fulfill her dream of becoming a fighter pilot. While I have heard many admire Hamza Ali Abbasi and his charm, for me his romance was a bit too cocky. Or maybe I’m too old for such young love. Otherwise Hamza and Nadir give us our own Maverick and Goose for sure. Ahad Raza Mir got a tough role and for the most part his character was not like-able. It was a courageous step taking up that role and he did brilliantly well! One thing I found lacking in the movie was really good humour that has been part of other similar projects such as Sonheri Din and Alpha Bravo Charlie. While there are a few laughs, witty writing is not Farhat Ishtiaq’s strength. Do go out and watch the movie! You will truly get a great insight into the life, trials and triumphs of PAF! Hope you liked this spoiler-free Parwaaz Hai Junoon review! Have you seen the movie? Previous Post Egg-Fried Vegetable Rice Recipe: Easy, Simple and Delicious! Thanks for the review – You should also go see JPNA2 (it is SO funny!) really fun watch (the humour you are looking for) And “TEEFA in trouble” left us laughing with tears rolling down our eyes! The best one so far – pls make sure you watch it. Yes I watched Teefa in Trouble! Hopefully can see JPNA2 also! Is it ok to take an 8 yr old boy to see this movie? Yes! He will love it. Very timely review 👍Yesterday we watched “Load Wedding “ Full Of humour & a great message in a very natural way .Here “کھلبلی” how to get tickets for any three of these movies ..We got tickets for tomorrow evening show .Very excited 😆 We all must watch our 🇵🇰movies and should encourage our movie industry .. I and my wife went to see the movie last night in Atlanta. Last show on a Sunday night but there were more folks then we expected. We thought the movie was excellent and there was not a moment where we felt like we were wasting our time and money. The story for the large part was predictable and had a few turns but no twists, yet the way characters were presented and stories intertwined, the end result was a very powerful and emotionally charged movie. We believe that the Pakistani Cinema is reborn and has a very bright future because of the involvement of educated producers, directors and actors. Pakistani television has had a major revival and most of the Pakistani Expats I know, have stopped watching the stupid shows form across the border. We need to stop comparing our movies to those of the neighboring country and we should at least patronize our own talent. I came across a few online reviews about PHJ and they all pointed out the flaws. A common lay-moviegoer only cares about the story and the entertainment value. This movie has a nice story and you leave the theater feeling very patriotic! So true! I totally agree with you!